During the last weekend of October, Antigua will play host to some of the most influential people in yacht racing from around the region when the Caribbean Sailing Association’s (‘CSA’) Annual Conference takes place. 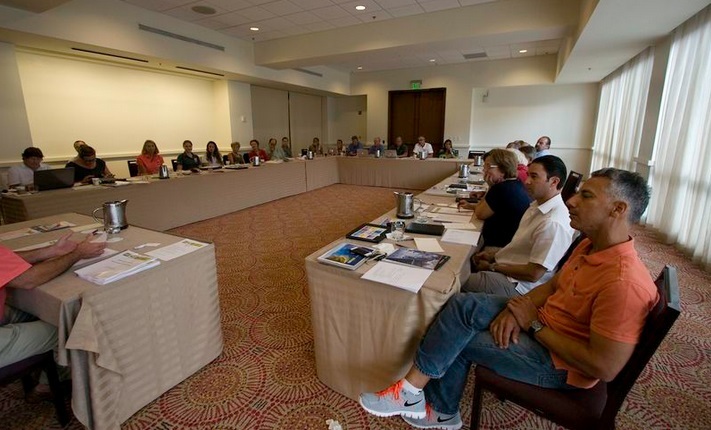 Planned over three days from the 24th – 26th October, regatta organisers, race officials, rating rule measurers and other industry stakeholders will converge on host venue, Antigua Yacht Club, for three days of seminars, discussions and networking opportunities. In the past few years the conference was held in St. Maarten and Puerto Rico. However, it was decided that Antigua would be the logical location to host the 2014 Conference given not only its central location making it easier for delegates to travel from across the region, but with the new CSA secretariat office being located at Antigua Yacht Club Marina along with the secretariats for Antigua Sailing Week and the Antigua and Barbuda Marine Association, it makes the planning logistically easier. The team responsible for organising the Conference alongside key CSA board members and also CSA board members themselves is Alison Sly-Adams and Kathy Lammers of Mainstay Caribbean Ltd., the management company responsible for managing the secretariat for all three non-profit organisations. During the 2014 Conference there will be a focus on youth and sailing development programmes and Antigua’s National Sailing Academy (‘NSA’) will play host to delegates during the Friday afternoon session of the Conference, showcasing what NSA has achieved and how it is playing its part in developing young Antiguan sailors and associated career opportunities. The participation of Tim Cross, the International Sailing Federation (‘ISAF’) representative for the region who specializes in youth and sailing development, will help organisations look at how they can create and develop their programmes as well as looking at potential new sources of funding to assist in continued growth. Sailors for the Sea, an environmental organisation committed to regattas being ‘clean’ and adopting environmentally positive practices, is a Conference sponsor and will be on the ground to work with Conference delegates to determine ways in which they can make their regattas environmentally sustainable. They will also assist in identifying funding opportunities to help regattas achieve their goals. The CSA Annual General Meeting and a meeting of CSA rating rule measurers will also form part of the Conference and there will be informal dinners and opportunities for delegates to network with their island counterparts. For more information about the conference, contact the CSA secretariat at secretariat@caribbean-sailing.com or call (268) 734-6366. More information about the CSA can be found at www.caribbean-sailing.com. The CSA Annual Conference takes place from 24th – 26th October, 2014. The Conference will be held at the Events Centre, Antigua Yacht Club.